August was a fun and busy month! I told myself that we would not be as busy this year but there are just too many fun things to do and see near where we live. 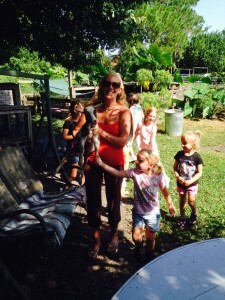 I am very grateful to live on the Space Coast of Florida, there are tons of homeschoolers and so many opportunities to get out, have fun, and learn along the way. Here are a few fun day trips that we took in August. 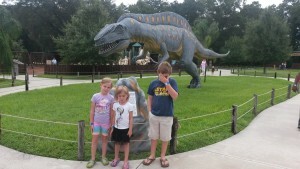 We headed to Dinosaur World. We had never been here so when a homeschool trip with discounted admission was offered we jumped on it! I promise they had fun, the sun was bright and they didn’t want to stop for a photo. 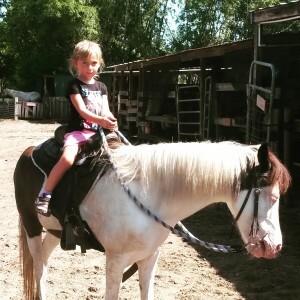 Ava has decided to stop taking gymnastics class and wants to ride horses. We took a trip with friends to a local farm to discuss setting up weekly lessons. We all had fun exploring the farm and the kids rode horses. 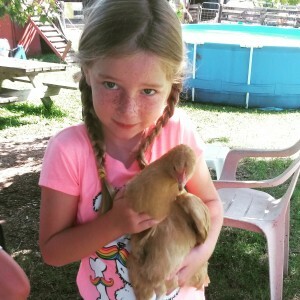 Ava enjoyed the chickens and cannot wait until we get some of our own. I helped rescue a runaway goat. Audrey enjoyed riding a horse! 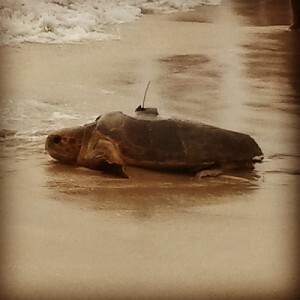 We tend to sleep in but we were happy to get up early to see the release of two sea turtles. 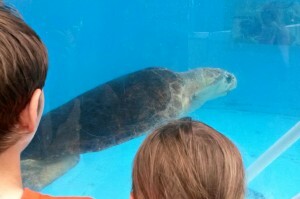 We also went on a great field trip to the Loggerhead Marine Life Center. The kids (and I) learned several things about sea turtles that we didn’t know. 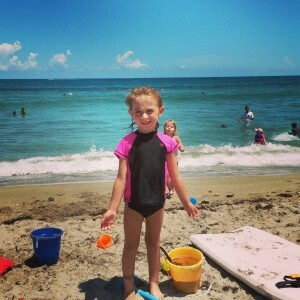 After that trip we headed to one of our favorite beaches, Bathtub Beach. Those are a few of the fun activities we did in August but we also started a new year of learning. 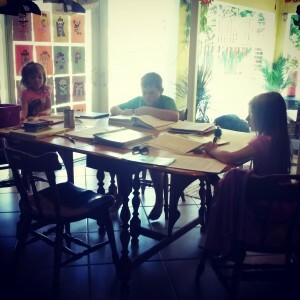 I am now homeschooling 3 kids. Audrey is beginning K, Ava is in 2nd grade, and Alex is starting 4th grade. 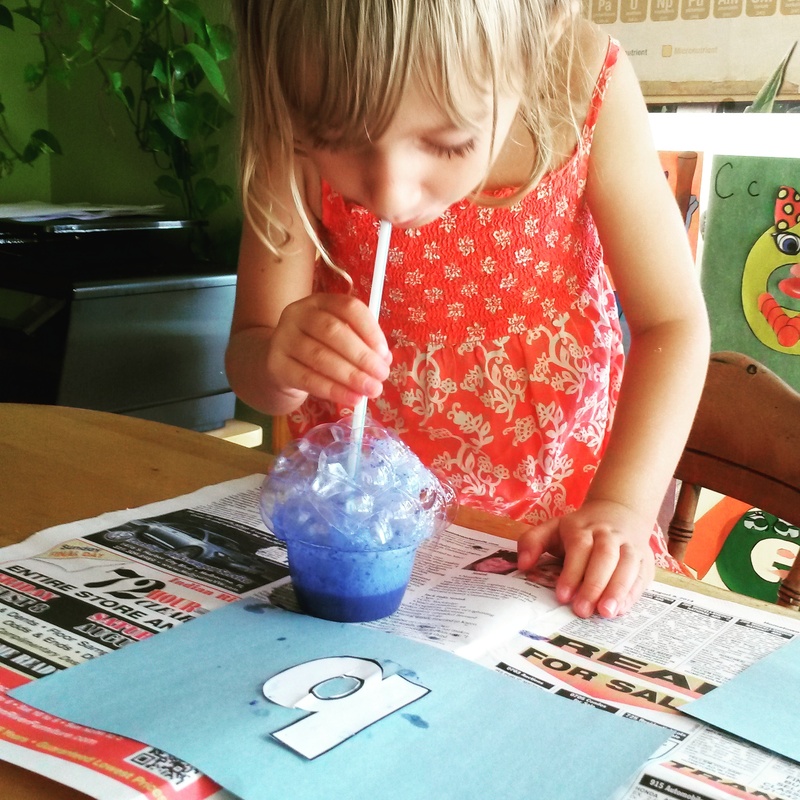 We do a lot of learning outside of our home, all over our home, and often at the dining room table. Alex & Ava are continuing Math on the computer using Teaching Textbooks. We are all enjoying this approach. Alex is currently discovering Chemistry. This is a subject that intimidates me so we are learning it together using Real Science Chemistry , we are learning and having fun along the way. 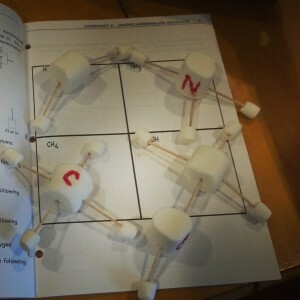 Alex had a blast making marshmallow molecules! We are still working on American History and have just begun the Civil War. Instead of piecing together our learning this year I am using Tme Travelers the Civil War in America Cd-rom . We don’t do it all. We mostly focus on the reading, lapbook components, and maps. Our home learning is secular so there are parts that we omit. Alex read Journey to the Center of the Earth this month. He completed a lapbook from Confessions of a Homeschooler on the book and watched the movie. He says the book was way better! 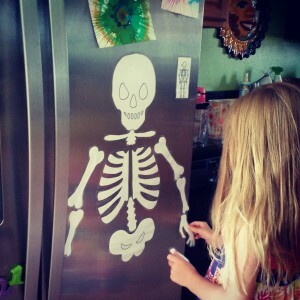 Ava learned about Bones using The Magic School Bus. We read The Search for the Missing Bones Chapter Book, No. 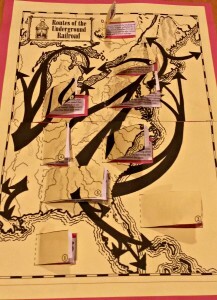 2) , completed this free lapbook on the book, and worked on several fun activities. She recreated the skeleton using bone magnets. The printable bones can be found here, I laminated them and glued magnets to their backs. 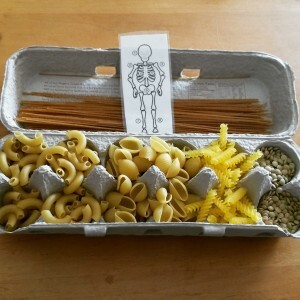 She made a noodle skeleton. And she glued her bones to a cutout of her body. Even Audrey enjoyed this activity! Ava is also working on American History but is not going as in-depth as Alex at this time. She learned about Sacagawea and Lewis and Clark this month. I use Adventures in America as a guide. She liked making a hide map from a paper bag. We all learned about Japan this month. Alex enjoys Highlights Top Secret Adventures, he loves to solve the mystery and he learns so much along the way. We also went to Epcot to discover Japan. The kids learned a bunch in the museum. 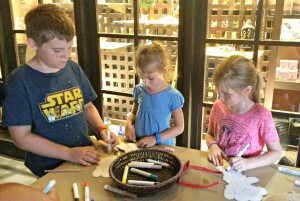 They made crafts, had their names written in Japanese on the back of them, and earned a stamp in their Epcot passport. 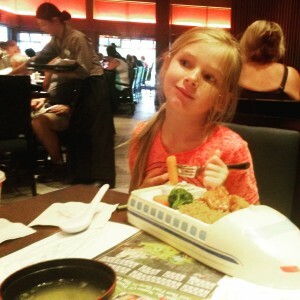 We had dinner ‘in Japan’. 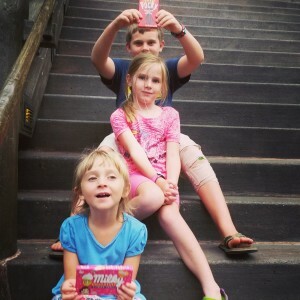 And enjoyed Japanese candy, homeschooling is fun and yummy! It was a busy month for sure. We learned a lot and had a ton of fun. This year of not going to school is certainly starting off right! If you are interested in seeing my layout of our learning year you can check it out here. Please know that it is a work in progress and is not complete (I can’t plan that far ahead!) but you may find helpful links or activities that you and your kids will enjoy. 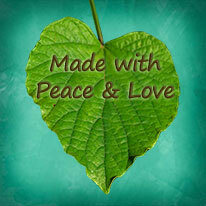 First Day of February Filled with Love! Looks like an awesome month of learning was had by all! 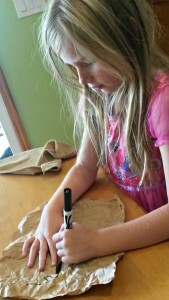 Thanks so much for sharing at the Hip Homeschool Moms Blog Hop.